With the Adopt-A-Soldier project, Wendy Robicheau is giving life to the names on Acadia's war memorials. On the campus of Acadia University in Wolfville, Nova Scotia, stand two concrete pillars, starkly framing the entrance to the gymnasium. Monuments to both world wars and the Korean War, the pillars are etched with the names of staff and students who died during the battles of those conflicts. Throughout the school year, hundreds of people walk by those memorials every day. But university archivist Wendy Robicheau noticed that the names didn’t seem to be resonating with passersby anymore. So she decided to bring those names to life. Wolfville Detachment of the 219th Bn. included students from Acadia University, seen in the background. 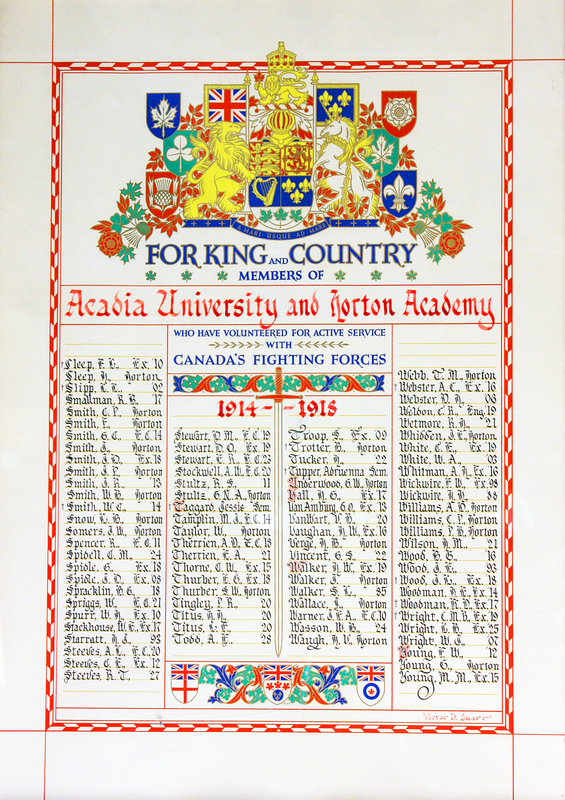 Nearly four years ago, Ms. Robicheau and two student researchers started gathering the names of everyone from Acadia and it’s two former affiliates, the Horton Academy and the Acadian Ladies’ Seminary, who served in the First World War. That number now sits at over 600 names (there are a few dozen cases where Ms. Robicheau has been able to prove either school enrolment or military service, but not both). The next step was to find out as much as she can about these people: Where did they serve? What did they study? What were their lives like? To do that, Ms. Robicheau has enlisted the help of the largest team of researchers she could find: the Wolfville community. Wendy Robicheau. Photo courtesy of The Kentville Register. 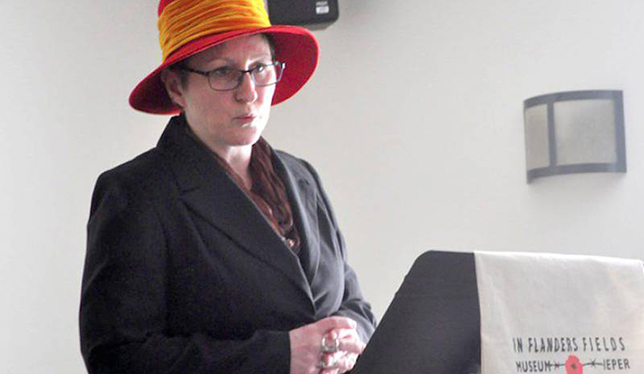 “I did a lot of presentations on campus [about Acadia’s ties to the wars], and people were just so interested in knowing more about individuals that it seemed like an obvious match to have people involved in the research,” explained Ms. Robicheau. She called the project Adopt-a-Soldier and the archival team at the university drew up a series of research guides for the public on how to scour the university’s archival collection, as well as records from Library and Archives Canada. About half the names on the list have been claimed, or adopted, so far. 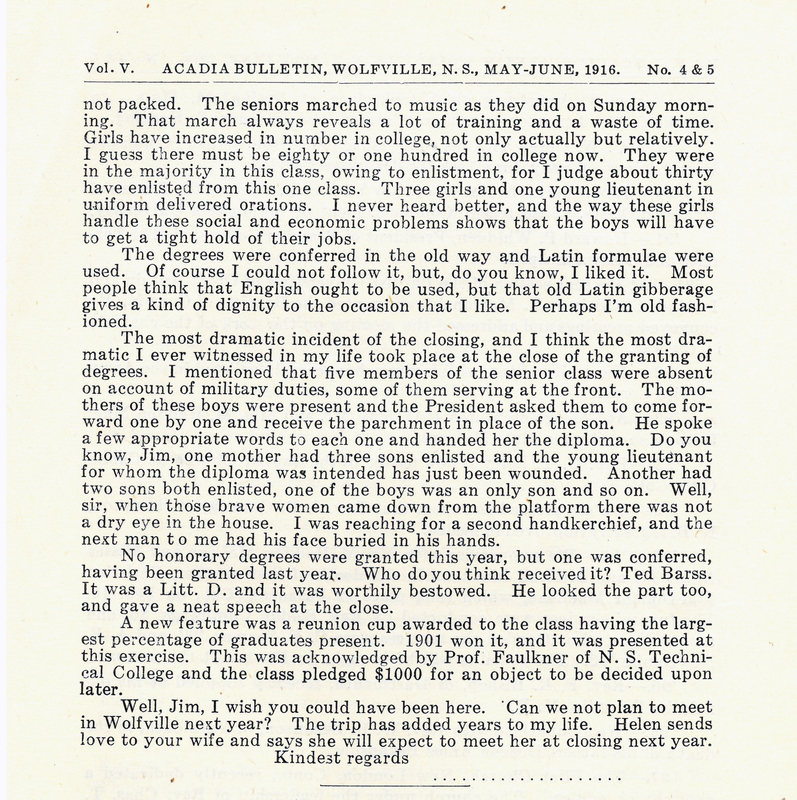 An excerpt from the Acadia Bulletin of May-June 1916 describing Acadia’s convocation ceremony in 1916. All photos courtesy of Acadia University Archives. 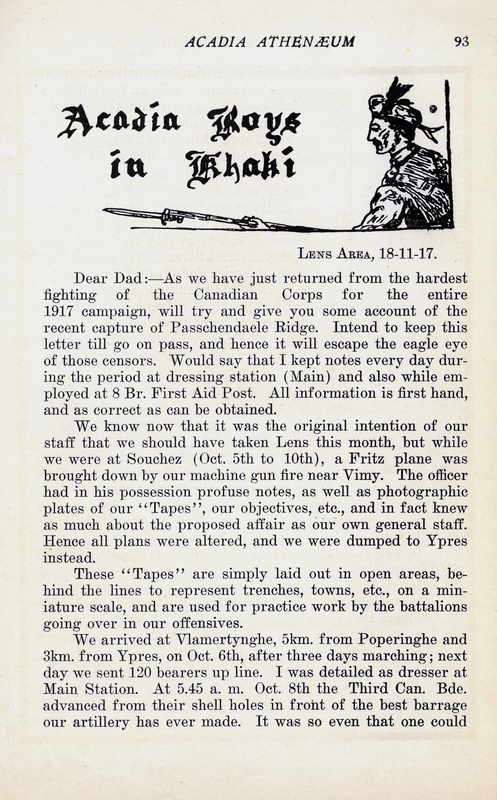 An excerpt of a letter from the front recounting the Battle of Passchendaele during the First World War, published in the January-February 1918 issue of The Acadia Athenaeum, a student newspaper at Acadia University. An obituary for Acadia student George B. 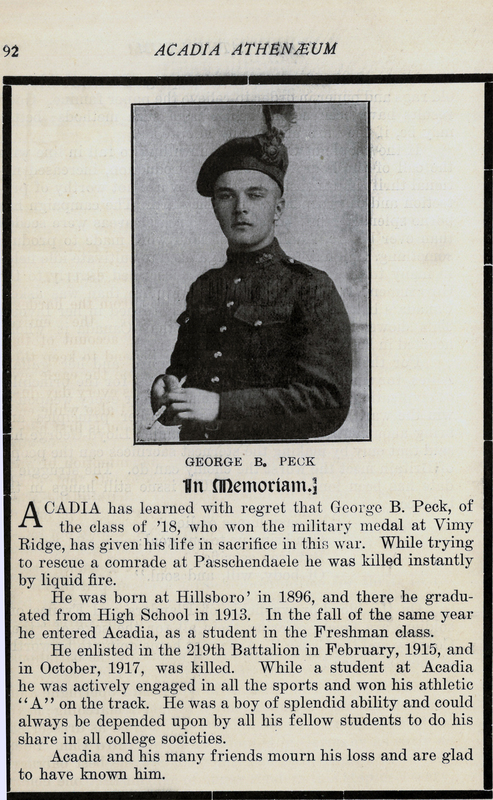 Peek, who died in the Battle of Passchendaele during the First World War, published in the January-February 1918 issue of The Acadia Athenaeum. 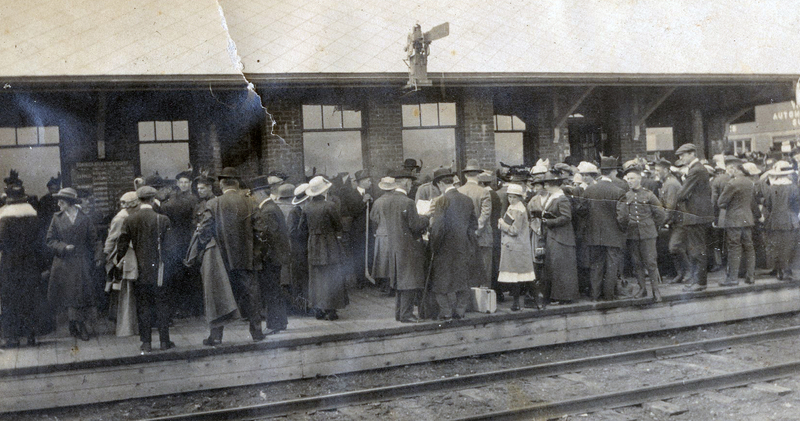 Soldiers at the train station in Wolfville, N.S., in 1916. From the Bessie Lockhart photo album, Acadia University Archives. Several framed plaques, commissioned in the 1970s, list Acadia’s war volunteers. They hang in the War Memorial Gymnasium. Photo by Catherine Fancy. She noticed that people are reluctant to sign on to the crowdsourcing project at first, concerned about the amount of work it will take. Once they’ve signed on, however, “as soon as they’ve finished one, they want five more,” she said. Ms. Robicheau hopes to compile the collected data into short stories over a sabbatical next year. She’s aiming to publish them in time for convocation in 2021, a century after some of those soldiers back from the war would have walked in their own graduation ceremony.